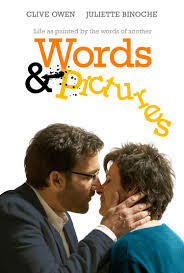 The trailer for Words & Pictures, starring Juliette Binoche and Clive Owen, makes it look like a light romantic comedy. Makes you wonder if the marketing folks even watched the film. The promo oversimplifies the story to its most basic elements: two teachers at a private high school clash on the relative importance of art and literature while falling in love. Not the movie; it was lovely. What is tragic is everything the trailer leaves out. I don’t expect it to reveal every detail — I’d prefer it didn’t — but the love story in W&P is very specific to the two teachers’ ages, health issues, and work and family situations. It’s complicated because their lives are more complicated, which makes it a more interesting and multi-layered story. And it deserves a trailer that reflects that. Oh well, I’m a happy camper — I got way more movie than I expected! This entry was posted in Advertising, Commentary, Entertainment, Humor, Movies and tagged advertising, art, Clive Owen, commentary, entertainment, film, happy camper, health issues, Humor, it's complicated, Juliette Binoche, life, literature, love story, movie promos, movie trailers, Movies, moving pictures, private school, promotion, review, romantic comedy, teachers, Words & Pictures. Bookmark the permalink.